EG: You recently completed six paintings, which are currently on show in Melbourne. These works have some kind of new techniques, or at least technical approach to the way in which you’re painting, or drawing images, yet for me they still very much recall your landscapes from around 2010 – 2013. The wood grain is fairly prominent again, or at least referenced and highlighted and forms the kind of basis for the landscape like the earlier works. MB: I’ve been developing a new way of incorporating imagery into my paintings for the past 2 or 3 years. You’re right that these new works relate to that earlier period you mentioned and this was something I was conscious of in the studio, but my process has changed quite a lot since then. EG: I know you wrote and spoke about how you traced over printed images for a number of years, but looking at these new works, I’m not entirely sure how they’re being made, the figurative elements at least. Certainly there is also a very obvious difference in the handling of the wooden board and the amount of sanding and almost damage that seems to be inflicted on it. That perfection of surface is now a complex history of how the work is made. MB: With these new works I’ve decided to not really explain how the images are made. It’s not so much that it’s a secret, I’m sure many people could figure out what I’m doing, but it’s that idea of the viewer figuring out things, which is becoming more and more important to me. I like the idea of the viewer being confronted with something that is very clearly a recognisable image, which is one way to enter the work, yet at the same time not being entirely sure how they’ve been made. It’s not a single process either, but a combination of a few techniques that merge together and make something quite different. There’s a big difference in how these works look from a distance, compared to how they degrade up close and I like that a lot. I just want more and more ways of making questions. EG: And what about the rough handling of the wood itself? Some of these works seems to have been sanded down even into the 2nd or 3rd layers of plywood, seen from an angle the surfaces are worn and even slightly wavy and three dimensional, yet the work itself seems utterly flat from front on. Also the corners are dented and scuffed and it’s clear that countless layers of paint have been added and removed throughout the process. Like a lot more time has passed. MB: Those works you spoke about before, around 2010 – 2013, or 2014 maybe, they really were so perfect in their finish. Even though I was sanding back then too, a lot of the ideas were pre-conceived and sketched before the work began, which meant less changes of direction, or spontaneity during the process. As a result those finished works are almost glass-like with the varnishes and finishing, quite fragile in a way. The works I’ve been doing since around 2015 have almost no planning and usually by the end, they have gone through so many changes and rethinks and restarts and partial or complete sanding that they’re somewhat battle scarred. This has let me work on the paintings as objects, as much as they are also images. In fact many of the works never end up with images at all and that’s opened up a new area of painting for me, but that’s a whole other thing. EG: So let’s talk about your images and how you use them. Some of them are larger and take front and centre, while others are scattered across the composition. I know you’ve spoken about using images as not only representations of ideas and associations, like symbols, but also as simply shapes and forms. MB: I know every time I use an image in my work, there are numerous ways that viewers will associate with it. For some, they may never even get past it. It will trigger memories, or trigger some pop culture reference, or symbolically suggest something, or else just be a purely literal thing. I don't really care about this side of it, because it’s totally out of my control. I have my reasons, but that’s that. Sure I have an idea of how people may consider them, but I can never know completely. People are often surprised when I tell them I select an image as much for the association it has to me, as for simply the shape, or colour of it. I can’t escape meaning when using images, but I can certainly use them as device for arranging within the flat plane of my surface. I choose to incorporate representational elements that are as close to their original form as possible, a bottle will be a bottle, like a cut out photo, because that’s more or less what it is and how I treat it. It won't be like a cubist attempt to reimagine how we see a bottle in real life and then try and show that experience in a 2d space. Playing with form is not something that interests me, I think of images like pieces that are pre-cut and can be moved around and fit together. EG: Horses are still a frequent image in your work, for example. MB: Right. And yet I’ve barely ever been up close to them and have never even ridden one. But I see them standing in fields here every single day and they amaze me. They’re so powerful and incredibly fast and can bolt in an instant, yet they spend most of the day standing perfectly still, almost trancelike, staring into space. Horses and humans have an ancient relationship and a very unique one. They’re also obviously incredibly common in painting the world over and the lineage of horses in art goes right back to cave paintings. Yet I also see them as this very unusual shape. Something that is both tall and vertical and horizontal at the same time, rounded and yet almost square as well. Then put a person on their back and the shape changes again. It just fits into my natural division of a composition really well. Perhaps it was from watching old westerns as a kid. I’ve got no idea. But it’s similar to why I paint so many pine trees and especially the kind of sculpted bonsai-like, or windblown ones. They have that same vertical and horizontal thing going on. EG: A lot of European painting portrayed the powerful steed controlled by royalty and generals dressed in all their finery. Your riders seem much more humble, but they still have a certain air to them, some kind of mystery, or even mysticism. MB: That’s the thing, it’s just more questions. The viewer is able to wonder. EG: What about the basketball hoop? We’ve spoken a bit about that earlier. But the two new works “Here and There” Numbers 1 and 2, have brought that image into a less logical place. 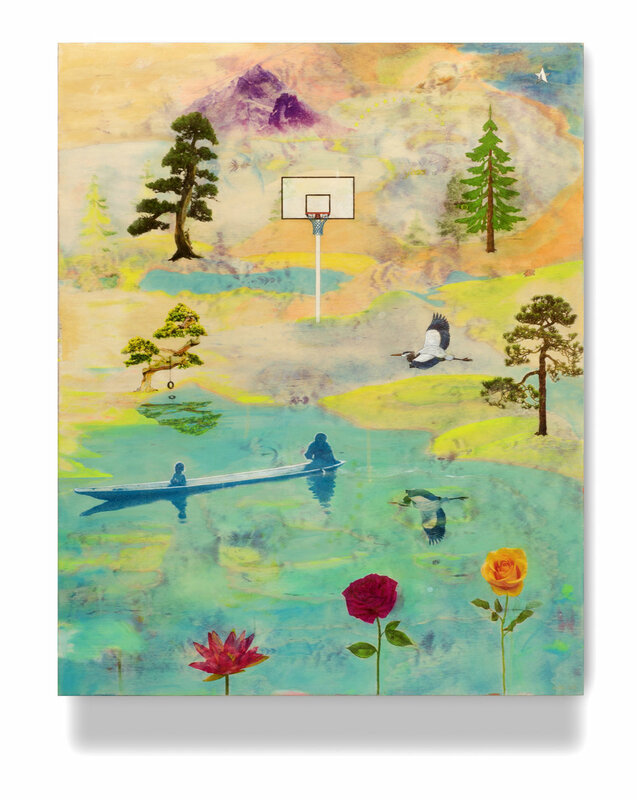 MB: Again, the basketball hoop and backboard has very little to do with playing basketball, even though that’s something I spent years doing as a teenager. Primarily again, it’s about shape and form and colour and how that contrasts with the more fluid, or organic forms of a non-urban landscape. A place we’re not used to seeing a basketball hoop. The park across from my house was where I first experienced this. When you stand on the concrete half-court, you see the rectangular, minimal design of the backboard, yet directly behind it is the most iconic and probably most photographed range of mountains in New Zealand. This contrast constantly surprises me and because it’s there in real life and I didn't have to contrive a way to bring this geometric form into the landscape and into my work, it appeals even more. Beyond that, the hoop and backboard and the pole also suggest a kind of figure to me. A solo figure in a landscape, almost with again a kind of mystical, or even religious overtone. It reminds me of certain paintings by both Colin McCahon and also Sydney Nolan. McCahon’s cross and Nolan’s Ned Kelly, that geometric, pre-set form brought into the familiarity of their landscape.